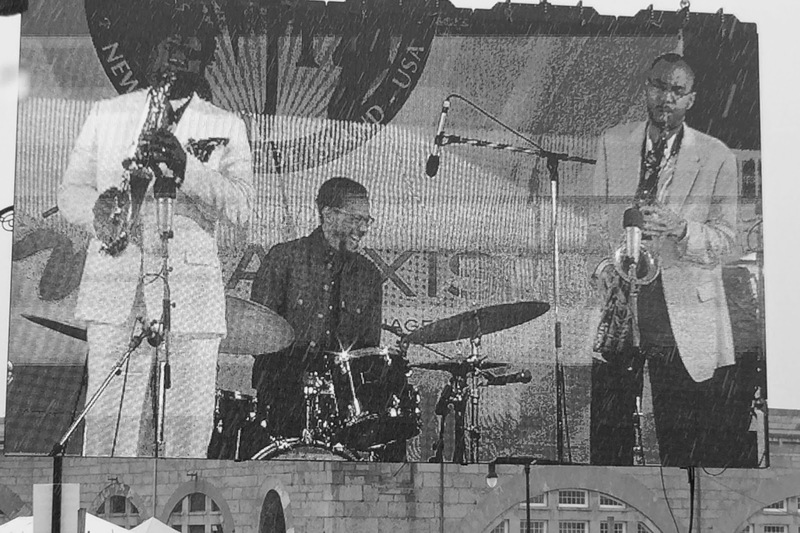 Saturday, August 2 at the Newport Jazz Festival presented by Natixis Global Asset Management was definitely an experience. It was pouring buckets of rain most of the day. George Wein, the festival founder, declared with a chuckle that everyone at the festival "crazy" for coming out. You know you love jazz when you stand in the pouring rain, seemingly freezing, but energized by the music that surrounds you. I arrived at the festival, and headed over to hear Brian Blade and the Fellowship Band. Every young jazz listener seems to be obsessed with Blade, and for good reason. His music is edgy, energetic, and exciting. Listen to Brian Blade on NPR Live at the Village Vanguard. I have talked about Glasper's music on my previous blog, Hip Hop in Jazz. I really like how modern and groove based his music is. The band utilizes a lot of electronic technology and effects to produce interesting sounds. 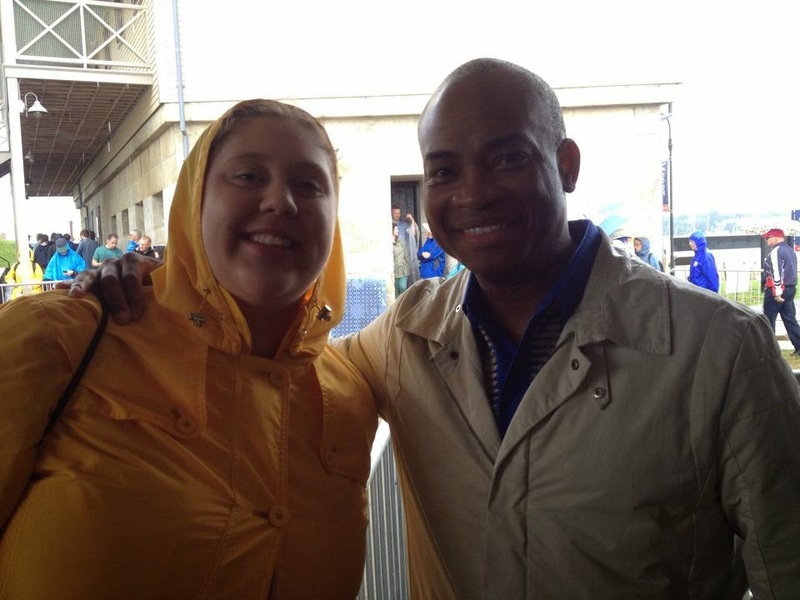 Afterwards, I met guitarist Russell Malone while waiting for Kurt Rosenwinkel's show to start. I saw him, and realized that he looked familiar, and then I remembered that I saw him when I went to see the Ron Carter Trio at the Regattabar a while back! I saw Rosenwinkel perform with the Jazz at Lincoln Center Jazz Orchestra a couple of months ago, and enjoyed his clean sound and modern sensibilities. His New Quartet seemed to meld really nicely together as a cohesive unit. Listen to Rosenwinkel on NPR Live at the Village Vanguard. I have seen the Jazz at Lincoln Center Orchestra perform at Boston's Symphony Hall as well as at Lincoln Center. I really enjoy the fact that each member of the orchestra is not only a world class performer, but also an excellent composer and arranger. The set they played at Newport showcased classic songs from throughout the sixty years of the Newport Jazz Festival. My favorite part of the show was when two saxophonists picked up piccolos and started trading on "Cape Verdean Blues" by Horace Silver. Dave Holland is an incredibly versatile musician. From playing acoustic bass with the most tender approach, to playing with the most buoyant fiery sound, Holland supports and carries any group he is in. "Prism" is a blazing new project by the bassist. 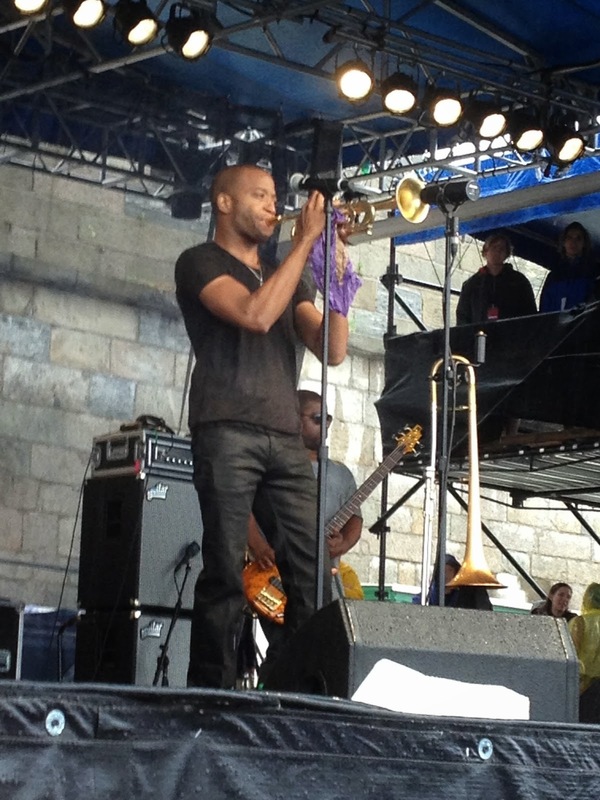 Lastly, I rocked out with Trombone Shorty. His music is punchy, mixing rock and New Orleans music to create a party atmosphere. Everyone in the audience started dancing when Trombone Shorty started playing. Listen to Trombone Shorty on this NPR Tiny Desk Concert. Throughout the poor weather, everyone still seemed to be walking on the "Sunny Side of the Street", with an excitement for music and life.